6 Chapter Overview 12 June 2003 North Star Chapter LB 6 2003 Tutorials The Spring Tutorial was a resounding success, bringing our chapter 36 new members! Many thanks to Paul Maggitti for organizing this event. If you would like to help with organizing the fall tutorial, please contact John Palmer. Tutorial organizers will receive free admission to the tutorial. 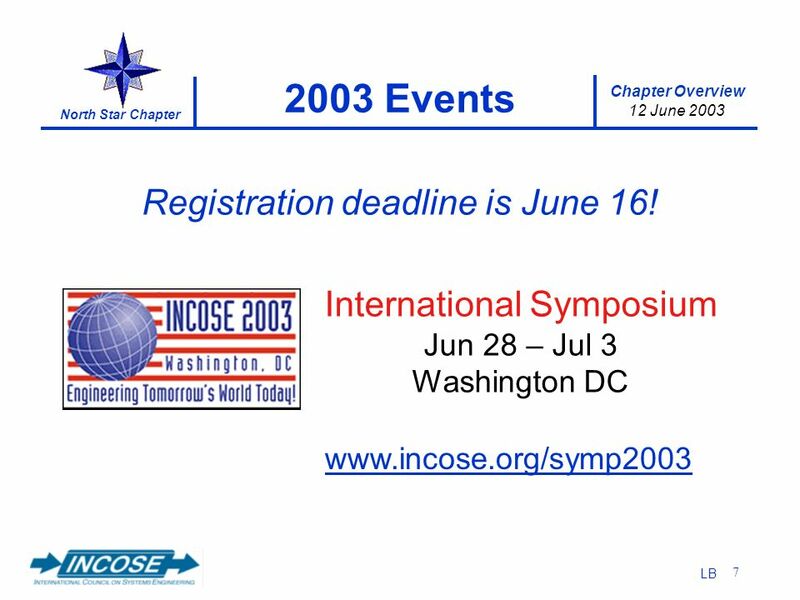 7 Chapter Overview 12 June 2003 North Star Chapter LB 7 2003 Events International Symposium Jun 28 – Jul 3 Washington DC www.incose.org/symp2003 Registration deadline is June 16! 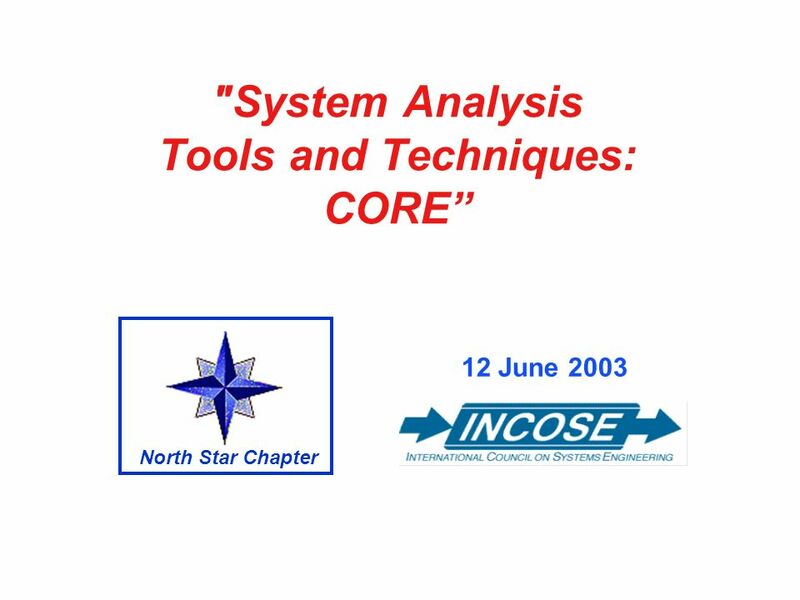 Download ppt ""System Analysis Tools and Techniques: CORE 12 June 2003 North Star Chapter." Chapter Meeting 12 January 2006 North Star Chapter PM Program Theme SE Interaction with other Disciplines Emphasis - Hands On Systems Engineering. 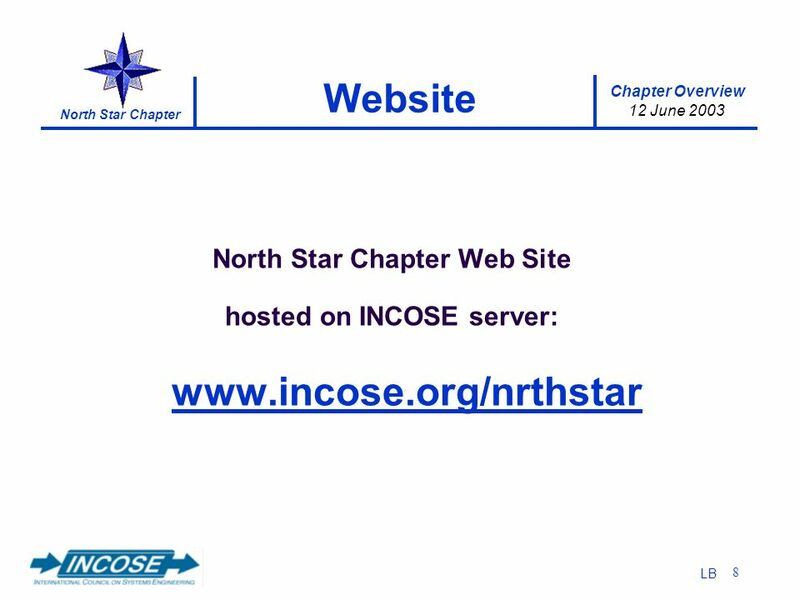 Chapter Overview 14 June 2007 North Star Chapter Program Theme Systems Engineering Practices in Industry Emphasis - Systems Engineering Interaction. Chapter Overview 18 February 2010 North Star Chapter 1 Tonights Schedule 6:15 PM – Registration, Networking, Pizza 6:45 PM – Welcome and Chapter Overview. Chapter Overview 18 June 2009 North Star Chapter Program Theme Practical Applications of Systems Engineering Emphasis – The Program Life Cycle. Chapter Overview 17 January 2008 North Star Chapter 13 March Program Theme Back to Basics Emphasis - Systems Engineering Life Cycle. 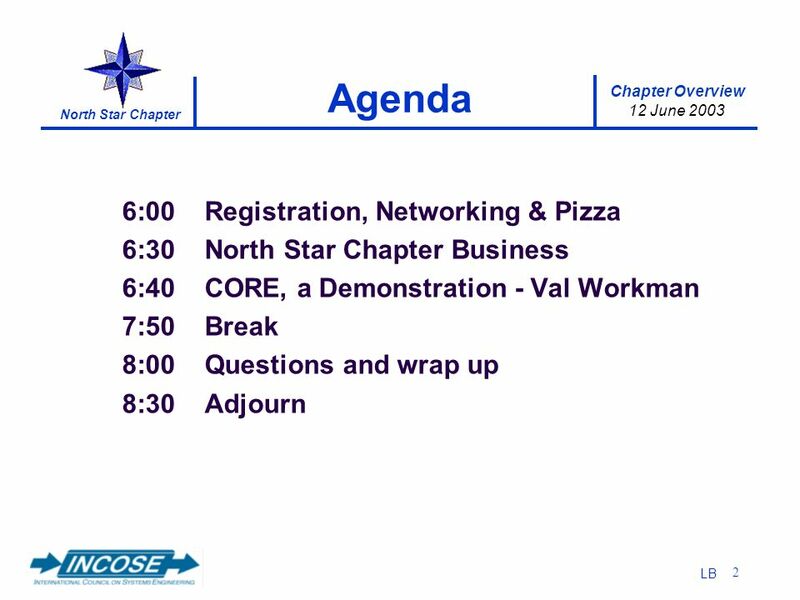 Chapter Overview 10 June 2010 North Star Chapter 1 Tonights Schedule 6:15 PM – Registration, Networking, Pizza 6:45 PM – Welcome and Chapter Overview Mark. 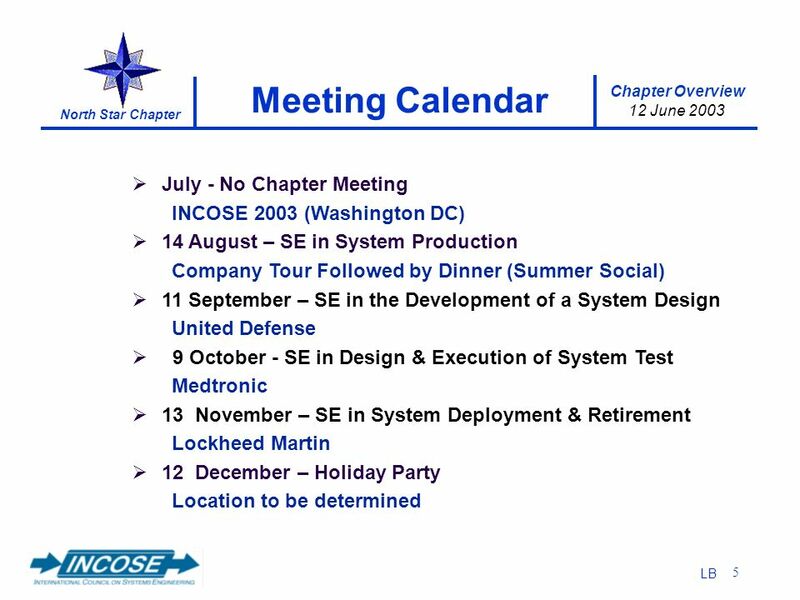 Chapter Overview 11 September 2008 North Star Chapter Program Theme Back to Basics Emphasis - Systems Engineering Life Cycle. Chapter Overview 17 May 2012 North Star Chapter 1 Tonights Schedule 6:00 PM – Network and Socialize over Snacks and Soft Drinks COURTESY of STRATASYS 6:30. Chapter Overview 12 February 2009 North Star Chapter Program Theme Practical Applications of Systems Engineering Emphasis – The Program Life Cycle. Chapter Overview 17 November 2005 North Star Chapter PM Program Theme Integrated Product Development Emphasis - Hands On Systems Engineering (Basics. Chapter Overview 13 April 2006 North Star Chapter Program Theme Integrated Product Development Emphasis - Systems Engineering Interaction with Other. 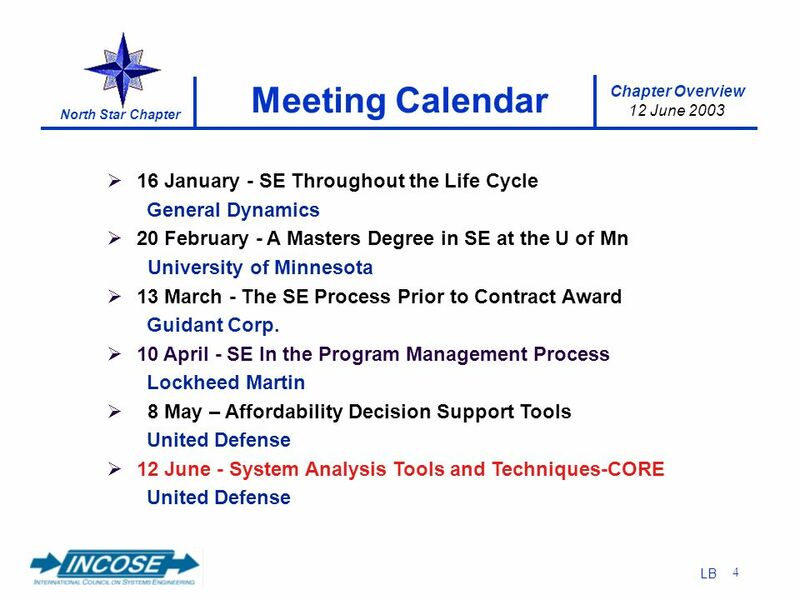 Progress Report - The Development of a Masters Degree in Systems Engineering at the University of Minnesota 20 February 2003 North Star Chapter. 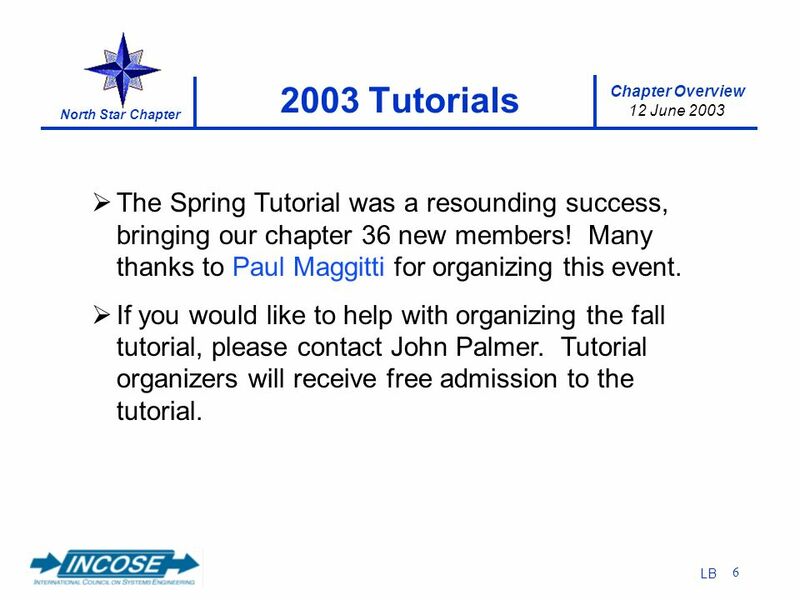 Chapter Overview 12 May 2005 North Star Chapter PM Program Theme Integrated Product Development Emphasis - Hands On Systems Engineering (Basics. 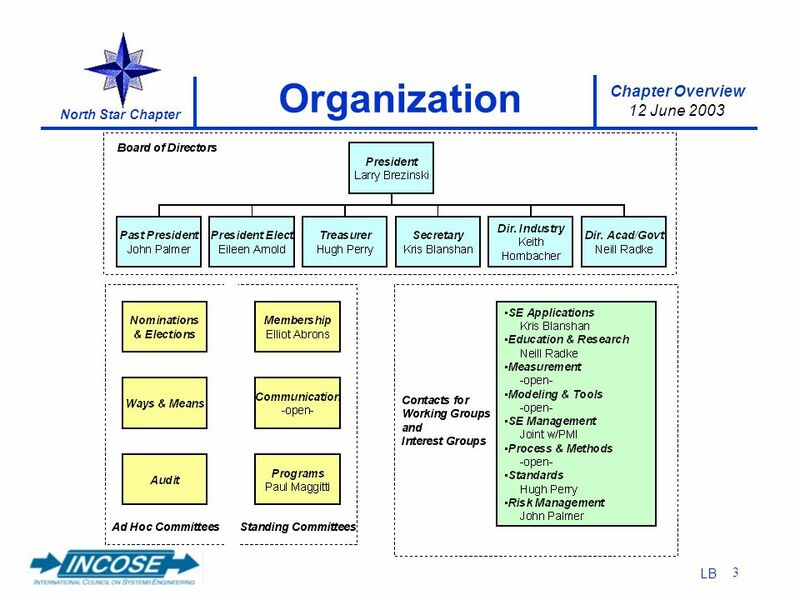 Chapter Overview 14 April 2005 North Star Chapter PM Program Theme Integrated Product Development Emphasis - Hands On Systems Engineering (Basics. Chapter Overview 13 October 2005 North Star Chapter PM Program Theme Integrated Product Development Emphasis - Hands On Systems Engineering (Basics. 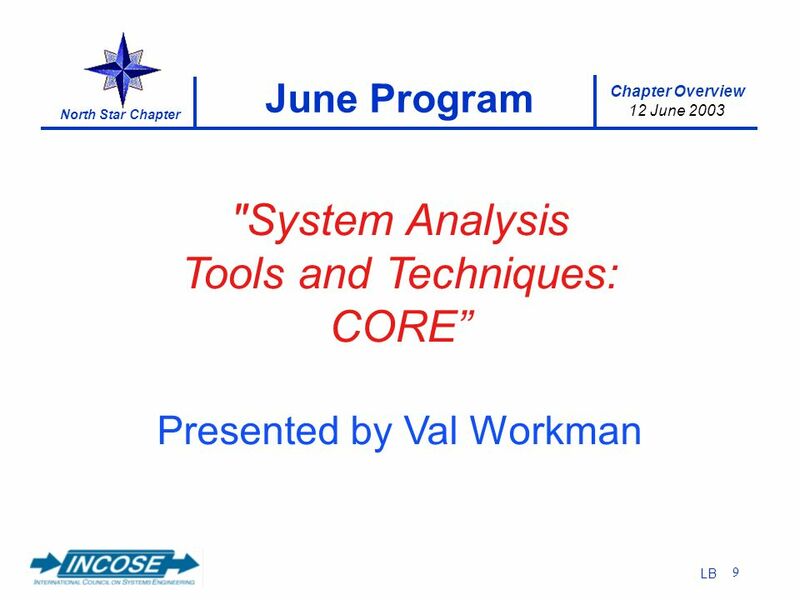 Chapter Overview 14 August 2008 North Star Chapter Program Theme Back to Basics Emphasis - Systems Engineering Life Cycle. Chapter Overview 11 November 2008 North Star Chapter Program Theme Back to Basics Emphasis - Systems Engineering Life Cycle. Chapter Overview 15 April 2010 North Star Chapter 1 Tonights Schedule 6:15 PM – Registration, Networking, Pizza 6:45 PM – Welcome and Chapter Overview. Chapter Overview 10 March 2005 North Star Chapter PM Program Theme Integrated Product Development Emphasis - Hands On Systems Engineering (Basics. Chapter Meeting 12 January 2006 North Star Chapter PM 1 2006 Program Theme SE Interaction with other Disciplines Emphasis - Hands On Systems Engineering.